(Trent Nelson | The Salt Lake Tribune) Utah Jazz guard Donovan Mitchell (45) shoots as the Utah Jazz host the Chicago Bulls, NBA basketball in Salt Lake City Wednesday November 22, 2017. The night Darrell Griffith learned he held a long-standing record was the same night he lost it. Griffith got a text from the Utah Jazz’s PR staff last Friday night. His rookie single-game scoring Jazz record of 38 points, the one he held for 36 years? It had been surpassed by Donovan Mitchell against the New Orleans Pelicans. Griffith was floored that he had held the record for so long, but not by Mitchell’s 41 points. That’s because Griffith, whose number hangs from rafters in both Louisville and Salt Lake City, has taken a special interest in the Jazz rookie since meeting him at a Cardinals practice years ago. 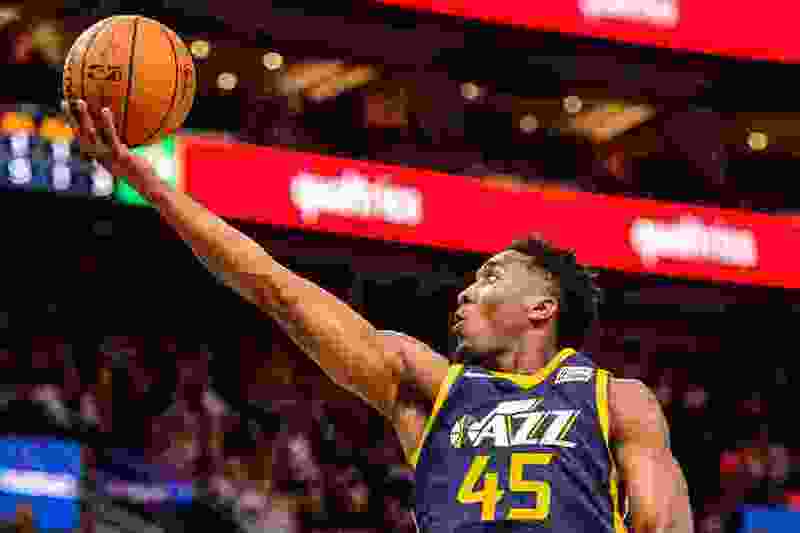 Mitchell’s stellar play of late has been drawing more and more comparisons to Dr. Dunkenstein — and Griffith, the only Jazzman to win the NBA’s Rookie of the Year, in 1981,might agree as much as anyone. It started when then-coach Rick Pitino told Griffith that he had a kid that had a game like his own — a bouncy player who really could dunk. They were introduced during a Louisville practice. Griffith has a godfather-esque aura in Louisville. He’s still the Cardinals’ all-time leading scorer and brought the school its first national championship in 1980. On campus, he serves as a special assistant to the university president. In town, he owns Griff’s, a restaurant frequented by students, including Mitchell. So Mitchell knew him by reputation, even before he met Griffith face-to-face. In the restaurant, there’s a photo of Griffith playing for Team USA jumping clear over another player. From the beginning, Griffith was impressed by Mitchell’s high-flying athleticism. By the time he arrived in Louisville, Mitchell already had made an impression with his dunks on YouTube. The highlights he accumulated as a Cardinal that made “SportsCenter” told Griffith that Mitchell didn’t need help in his aerial game. But Griffith, who famously made shots “from the parking lot” in Hot Rod Hundley’s parlance, felt that Mitchell’s improving jumper would be the key to opening up things. Griffith went through that transformation himself. While he came to Utah with an athletic profile that made him an explosive dunker, Frank Layden asked him to work on his 3-point shot, which had been added to the NBA the year before. In time, Griffith’s game became balanced. He eventually set the NBA record in back-to-back seasons with 91 then 92 3-pointers. Those numbers are dwarfed by the modern-day emphasis on 3-pointers — Mitchell already has shot 61 this year — but the lesson is timeless. Dr. Dunkenstein’s prescription for Mitchell, then a dunk specialist? Extend his range. To improve, Mitchell takes notes on the stars. Watching LeBron James’ career unfold has taught him the value of adding a reliable jumper to his aggressive driving. Looking at Steph Curry’s jumper has taught him the importance of adding arc to his shot. Working on his shot before the draft and now with assistant coach Johnnie Bryant has helped improve his 3-point shooting (32.9 percent in college) to 37.7 percent in the NBA, more than a respectable threat. And he’s shooting 46.6 percent from deep and averaging nearly four made 3-pointers per game during his recent tear in the last seven games, during which he’s averaged a herculean 23.0 points. That means defenders are having to go over screens on the perimeter, which leaves him open for the kind of play he made against the Clippers where he left Austin Rivers in the dust and leaped for a wide-open alley-oop. The challenge for Mitchell, particularly as he rises up the scouting report, will be to keep those ups high. 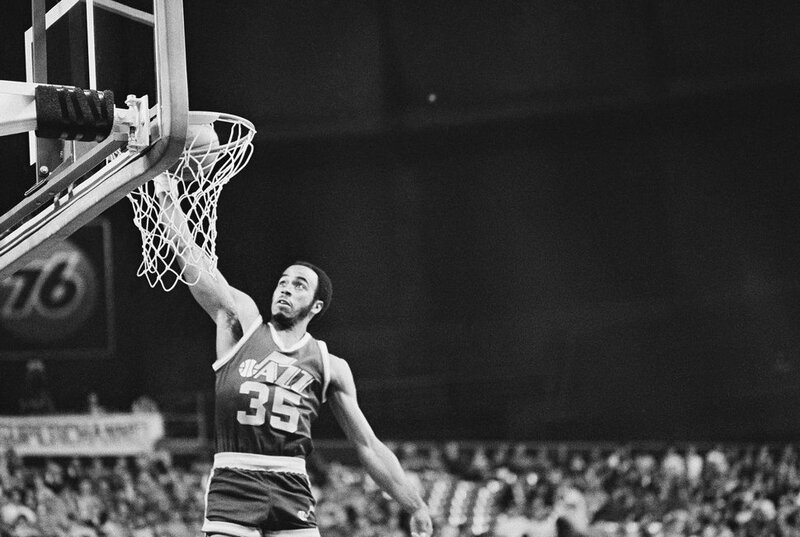 Griffith was able to do it as a rookie, finishing as the second-leading scorer on the team (20.6 points a game) to Adrian Dantley. His rookie record of 38 points was set in a February game against the Boston Celtics, and he would go on to score 25 points or more in four more games afterward. Mitchell has stiff competition for NBA Rookie of the Year, including Philadelphia’s Ben Simmons, Boston’s Jayson Tatum and Los Angeles’ Kyle Kuzma. But he said he’s trying his best not to worry about how he stacks up with other rookies — or with Griffith, for that matter. Griffith will try to track it for him. He’s been telling anyone who will listen since draft night that Mitchell and the Jazz were a perfect pairing for one another. Patrons at Griff’s have been buzzing about Mitchell’s breakout season in the NBA so far, and Griffith joked that there’s a meal waiting for him there anytime he returns to Louisville now that NCAA guidelines don’t restrict him. It’s been 36 years since a rookie in a Jazz uniform sparked interest in Louisville. Now, Griffith is getting to learn what that’s like. Rookie Donovan Mitchell has been compared to Darrell Griffith as high-impact rookie guards who both played for Louisville. But just how closely do they measure up? About the Rockets • Houston has won seven straight games by an average margin of 21.6 points. … James Harden leads the NBA in scoring (31.7 ppg) and scored a career-high 56 points in his last game against Utah. … Ryan Anderson is listed as questionable for the game with back tightness after exiting early in Sunday’s game against the Los Angeles Lakers. About the Jazz • Donovan Mitchell has set an NBA record for most 3-pointers in a rookie’s first 25 games with 61 this season. … Utah has the second-best point differential to the Rockets over the last seven games (plus-19.7), during which the team has gone 6-1. … The 17-point lead against the Oklahoma City Thunder is the largest the Jazz have blown this season in a 100-94 loss Tuesday.